Following closely behind this pop diva, the VMA frequenter Eminem and newcomer Iggy Azalea are the second potential biggest winners for VMA 2014 with seven nods apiece. Of course, there are also plenty of A-listers nominated in MTV Video Music Awards 2014 with multiple nominations. Give a glance at the table below and get VMA 2014 nominations. 5 Seconds of Summer—"She Looks So Perfect"
Schoolboy Q—"Man of the Year"
Avicii — "Wake Me Up"
Arctic Monkeys— "Do I Wanna Know?" Drake—"Hold On, We're Going Home"
Find out your favorite singers on the above list? If no, calm down! This is just a part of the 2014 VMA nominations and your idols may also appear on the VMA 2014 performance stage. Joining the lineup of performers for the MTV Video Music Awards 2014 are Queen Bey, Iggy Azalea, Jessie J, Ariana Grande, Maroon 5, Nicki Minaj, Taylor Swift, Usher, 5 Seconds of Summer and Fifth Harmony. So many super stars that it's high time to protect your throat and get ready to scream! What if you have missed this annual audio-visual feast? No biggie! You can catch VMA 2014 wonderful yet exciting moments from YouTube once your network is connected stably. Alternatively, it's advisable for you to resort to MacX YouTube Downloader to fast yet free download 2014 VMA the infectious live videos or the fantastic nominated/winning videos for your offline unlimited watching just a click away. Mean to extract songful audio from VMA 2014 best music video as your iPhone Ringtone? Click here! Irrespective of the music video of 2014 VMA you wanna download belongs to the SD MP4, FLV, 3GP format or the HD video in 720P, 1080P, 4k UHD (4096 x 2160), it won't amount to much for this all-conquering YouTube downloader to flawlessly download VMA 2014 video from YouTube free with zero quality sacrificing. Step 1: After free downloading and running this ideal YouTube downloader for 2014 VMA, open your web browser and the VMA 2014 video you'd like to download. Copy the video URL, paste it to the message box and then click "analyze" to load the music video details. 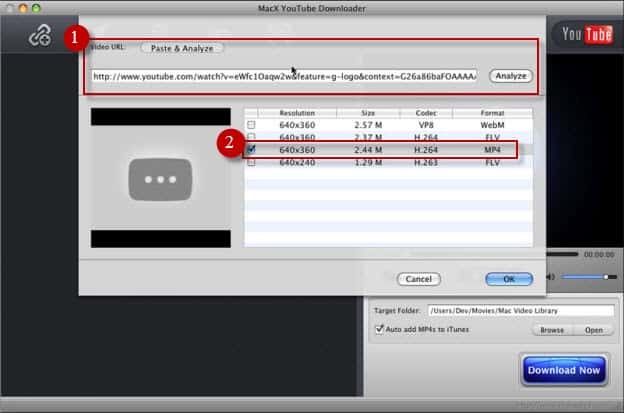 Alternatively, you can press "paste & analyze" button and the download software will automatically detect the YouTube video. Step 3: Press "Browse" button to specify an output folder on your computer to save the downloaded 2014 VMA videos. Step 4: Hit "Download Now" to begin downloading 2014 VMA video from YouTube on Mac for free. Only several mins, you are allowed to enjoy the sensational video of 2014 MTV Video Music Awards without any bother. 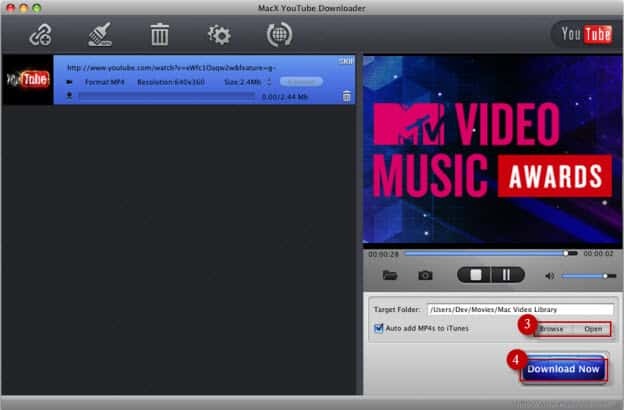 Warm Prompt: MacX YouTube Downloader is the perfect choice for you to download VMA 2014 videos form YouTube with nary a cost. Yet, usually the freebie confronts the insurmountable technical barriers. For instance, if you discover a better way to enjoy 2014 VMA video like watching it on your iPhone iPad, regret to inform you that this free YouTube downloader is powerless to make this job done. But the silver lining is that its advanced MacX Video Converter Pro fits the bill to aid you to download and convert any 2014 VMA music video to iPads, iPhone 6S/6S Plus, Galaxy S6 edge+/Note 5, iPad Pro/mini 4, etc with around 200 video and 14 audio formats standing by.